I'm trying to avoid Ferguson posts. Long ago I identified the unrest as commie agitation, and nothing has led me to suggest otherwise. 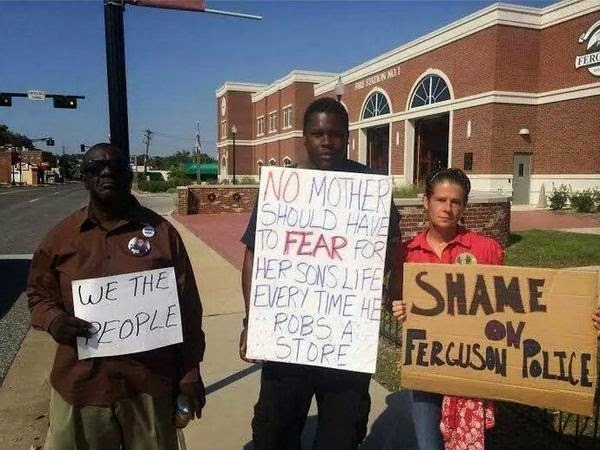 A black man trolling the Ferguson protesters. Sure, it is like shooting fish in a barrel, but still. He stood out there with that sign, and I am compelled to salute his counter-revolutionary activism with a hearty Ushanka Tip. No mother should have to FEAR for her son's life every time he robs a store. Related: Gateway Pundit reports a black teen said officer Wilson "did his job" at a recent Ferguson Commission meeting held by the incompetent MS Governor. Common sense is leaking out of the black community, albeit a few months late. I'm still waiting for a muslim to denounce 9-11. Comrade Mr. B. tells us in the comments that this is a photoshop. 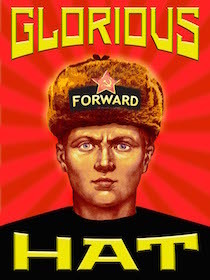 If so, please redirect my Ushanka Tip to the photoshop guru. It is a photoshop, and a damned good one.